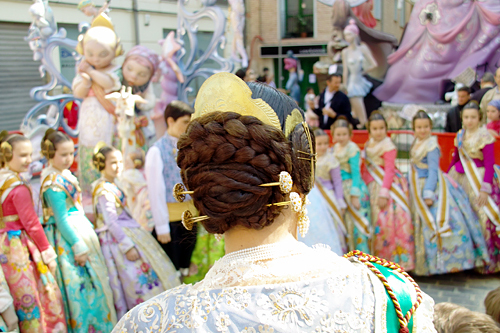 It boggles our minds how little Fallas is known outside Spain, and how little media coverage this festival (one of the world’s largest) receives. 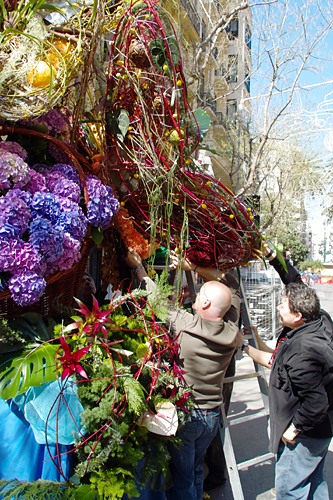 There are different speculations on how Fallas originated, but we tend to believe that it started as a way to mark the beginning of Spring, and celebrate renewal. 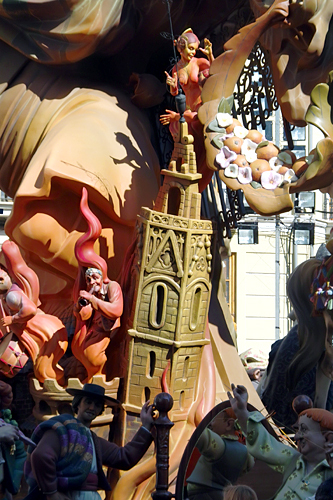 One theory suggests that the Falles [Falles = Valencian spelling of Fallas] started in the Middle Ages, when artisans put out their broken artifacts and pieces of wood that they sorted during the winter then burnt them to celebrate the spring equinox. Valencian carpenters used planks of wood to hang their candles on. These planks were known as parots. During the winter, these were needed to provide light for the carpenters to work by. With the coming of the Spring, they were no longer necessary, so they were burned. With time, and the intervention of the Church, the date of the burning of these parots was made to coincide with the celebration of the festival of Saint Joseph, the patron saint of the carpenters. This tradition continued to change. The parot was given clothing so that it looked like a person. Features identifiable with some well-known person from the neighborhood were added as well. 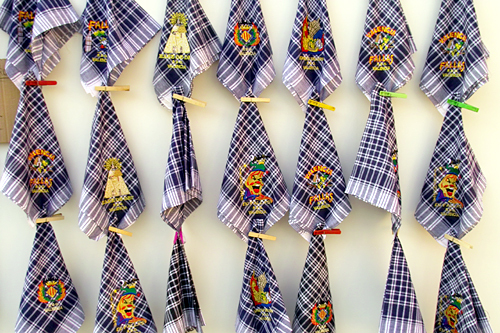 To collect these materials, children went from house to house asking for Una estoreta velleta (An old rug) to add to the parot. This became a popular song that the children sang to gather all sorts of old flammable furniture and utensils to burn in the bonfire with the parot. These parots were the first ninots. 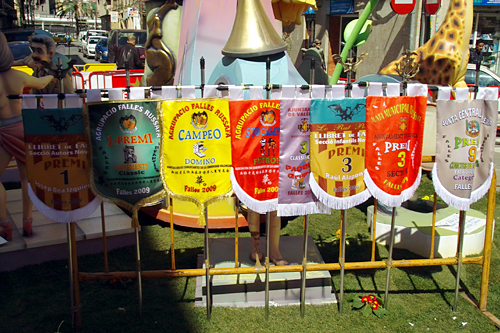 With time, people of the neighborhoods organized the process of the creation of the Falles and monuments including various figures were born. 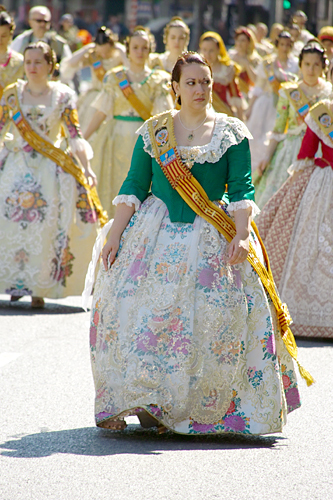 Until the beginning of the twentieth century, the Falles were tall boxes with three or four wax dolls dressed in cloth clothing. This changed when the creators began to use cardboard. 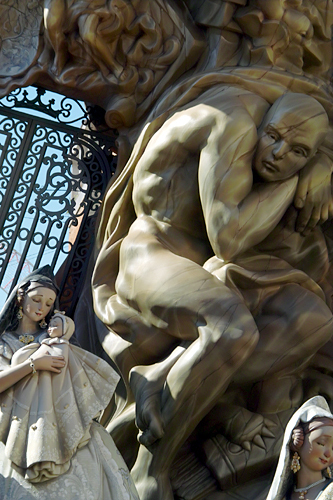 The creation of the Falle continues to evolve in modern day, when largest monuments are made of polyurethane and soft cork easily molded with hot saws. 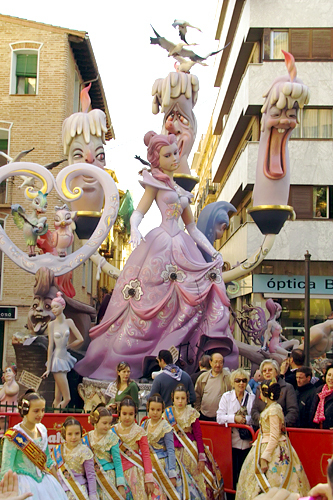 These techniques have allowed Falles to be created in excess of 30 meters. Each neighbourhood of the city has an organized group of people, the Casal faller, that works all year long holding fundraising parties and dinners, usually featuring the famous speciality paella. 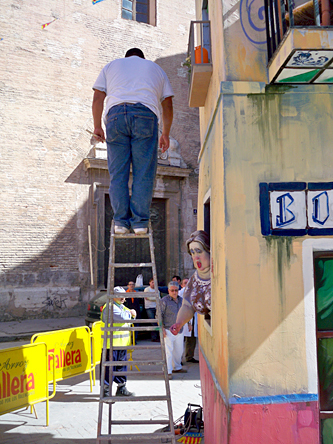 Each casal faller produces a construction known as a falla which is eventually burnt. 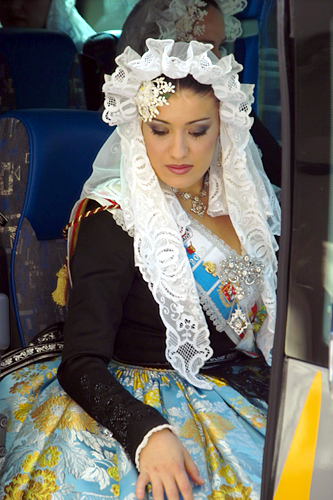 A casal faller is also known as a comissió fallera. Does that sound boring? Well, it’s not. 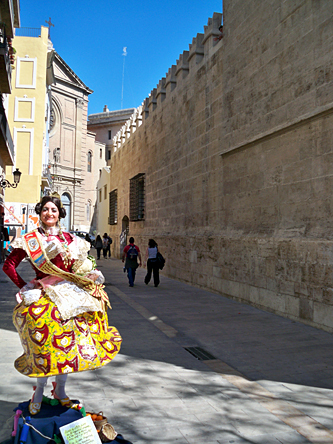 The influence of Fallas can be felt in Valencia constantly, with small and big events taking place throughout the year. 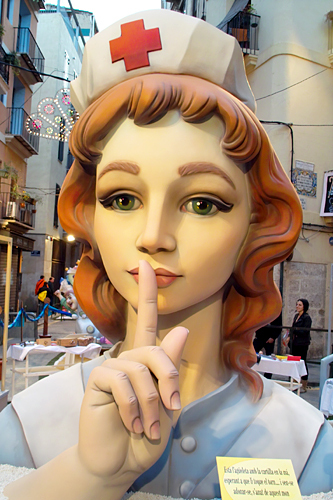 Fallas officially starts on the last Sunday of Feburary with La Despertà, a parade meant to awaken the city. 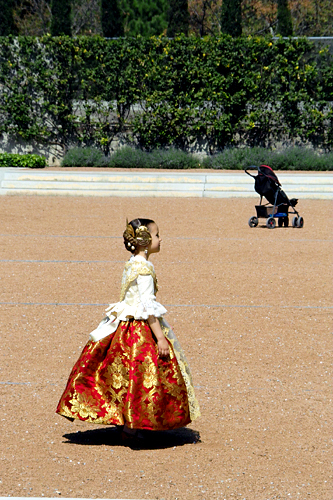 Our first year in Valencia, we lived along the parade route and didn’t know anything about it. Shaken out of bed by thunderous explosions at 7:30am, we thought WWIII had just broken out. This year we were prepared. 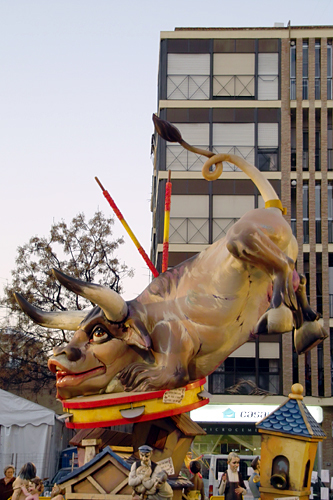 Later that evening, La Cridà, the official opening ceremony of Fallas, is held at Torres de Serrano. 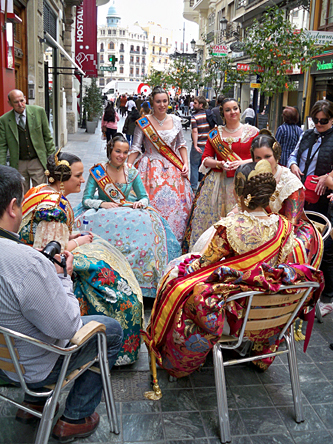 Things calm down, then, until the first of March, when the daily mascletàs in Plaza del Ayuntamiento begin. 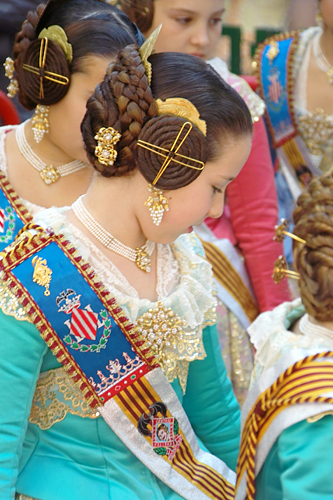 Throughout March, events take place every day but the main festivities don’t get underway until the 15th: the day of La Planta. 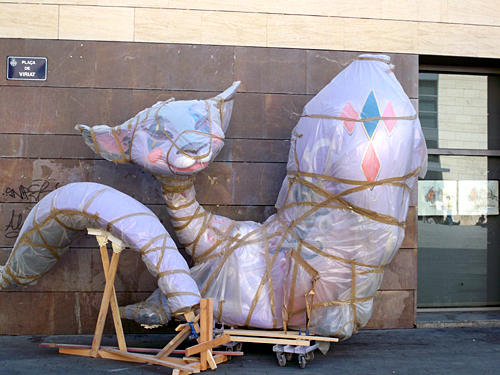 During La Planta, hundreds of Fallas commissions set up their figurines throughout the city. 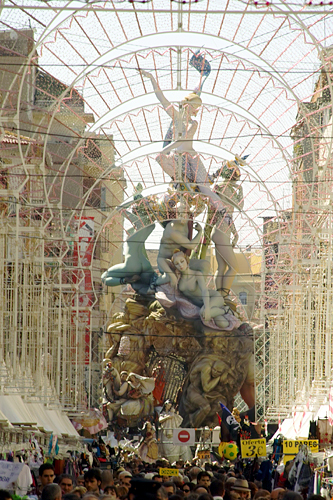 If you truly want to experience Fallas, come from the 15th to the 19th. You’ll need all five days. 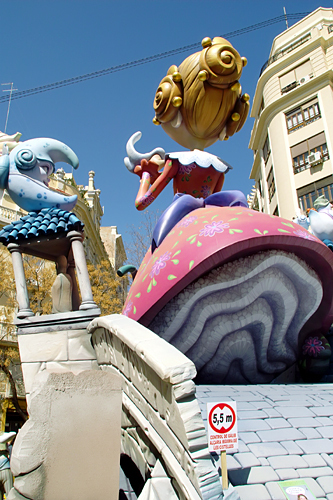 In 2009, there were over 600 figures spread across Valencia. They’re of varying sizes, from small to absolutely mammoth: 2009’s most expensive figure, Nou Campanar’s prize winning ode to the world of fashion, cost over a million dollars. From the 15th to the 19th the city finds itself in a permanent state of madness. 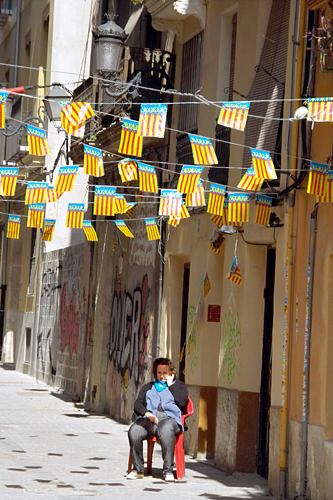 Fireworks, parades, music, street parties, mascletàs, ninots, paella, liquor and insomnia. 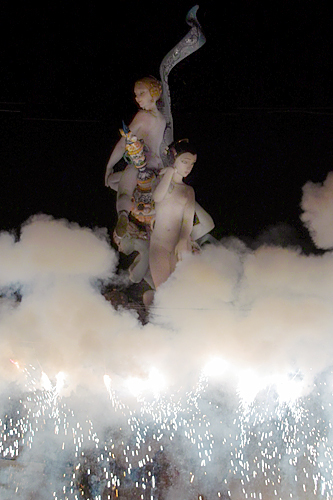 Fallas comes to an end on 19th of March, during an event known as La Cremà. 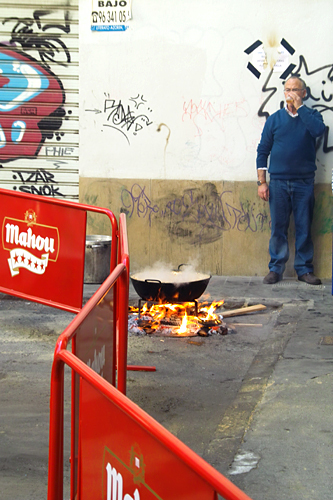 Starting at midnight, all the Fallas figures are burned to the ground. The whole city seems to be in flames, and the huge bonfires on almost every block make for a surreal experience. By the next morning, everything’s cleaned up and back to normal — you’ll find yourself walking the city streets, wondering if everything was just a dream. It’s a fun time of year, but so exhausting and I’m never sad when it’s over. 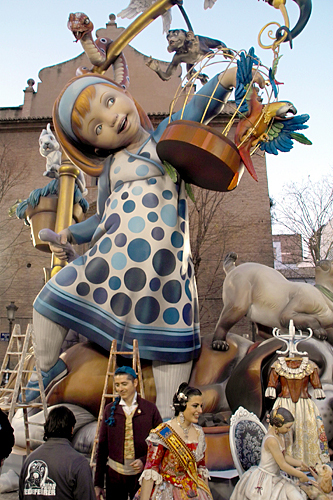 Still… I have to admit that writing this has made me super excited for Fallas 2010! 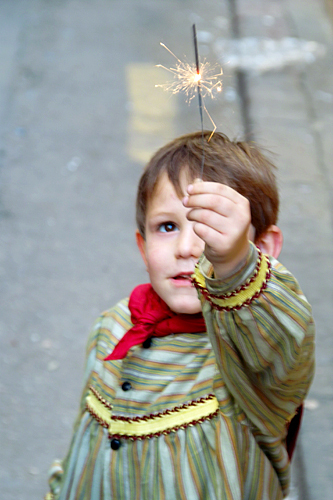 Here are some tips for getting the most out of Fallas. First off: this festival is not for everyone. 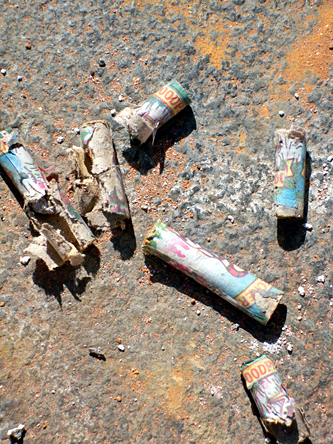 If you can’t tolerate noise and firecrackers, then you’d be well advised to stay away. 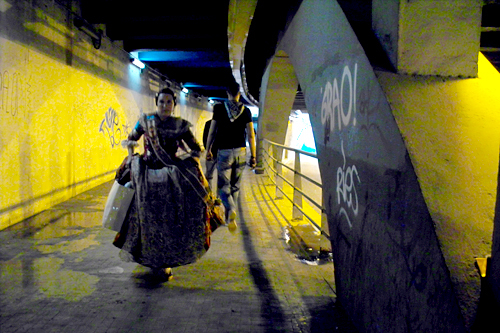 As a matter of fact, many Valencians detest Fallas and vacate the city as the hordes of revelers arrive. 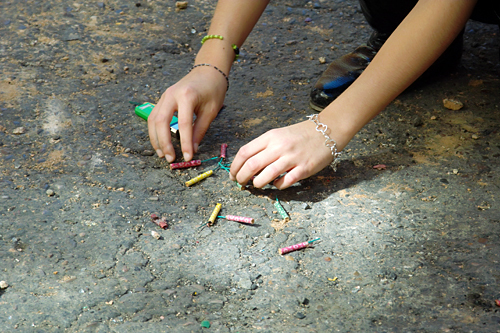 Before I moved to Valencia I wasn’t much of a firecrackers fan, but you get used to them. Especially after that first mascletà! About mascletàs: Don’t go if you have problems with your ears. They’re extremely loud, even if you’re prepared. 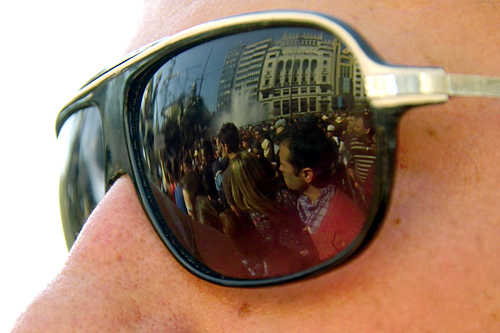 If you’re unsure whether you’ll like it, I recommend watching from the northern end of Plaza de l’Ayuntamiento. You can always get closer. If you’re a daredevil or hate your eardrums, show up 20 minutes before 2pm and claim a front-row spot. 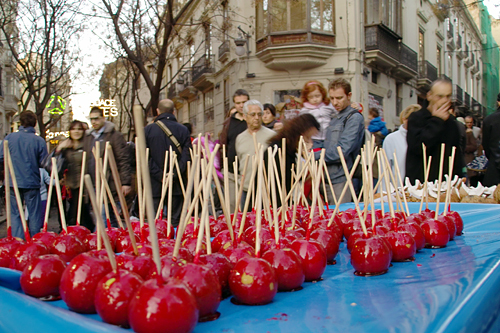 Actually, for the last 5 mascletàs, make that an hour early — these are the most popular and the plaza will be packed. 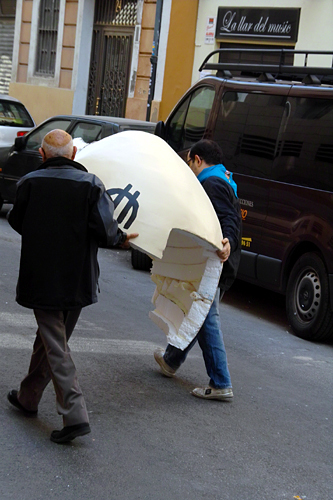 Be warned of Street Mascletàs!!!! These are smaller and look less threatening than the large city-sponsored ones, but they are far more intense. Long pants to protect yourself from shrapnel (really!) and sunglasses aren’t a bad idea. Above all — if it gets too loud, don’t stick your finger in your ears. This prevents the regulation of air pressure and could damage your eardrum. The trick is to cover your whole ear with your hand and keep your mouth slightly open. Try to take a siesta. 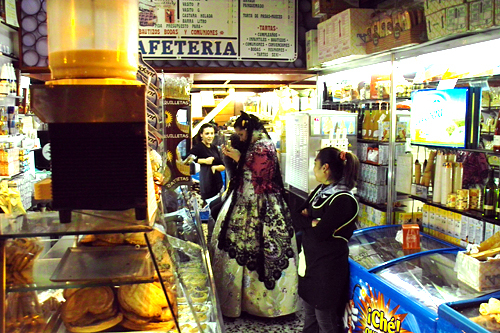 After the 2pm Mascletà, eat and rest up so you’re ready to go out again around 6. 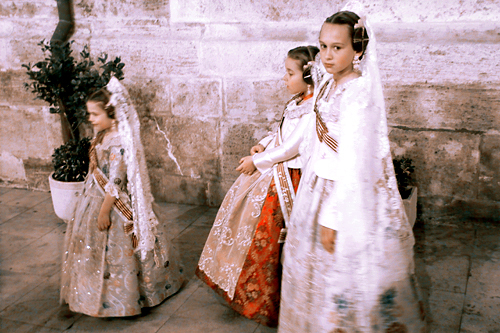 With luck, you’ll have energy enough to stay out until the early morning hours — just like a real Valencian! Don’t wait around until the last minute to find accomodation. 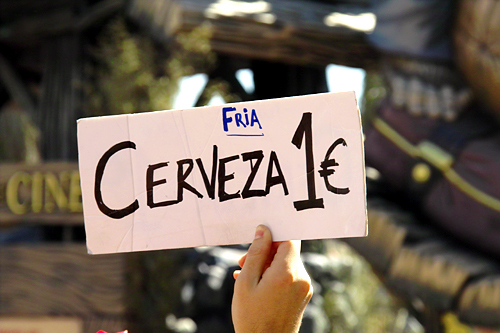 Prices climb as the festival nears — for example we saw a single dorm room bed being sold for €150 per person per night. If you can’t find anything feel free to email us. If you’ve got questions, concerns or additions for this post feel free to leave a comment or email us via our contact form. 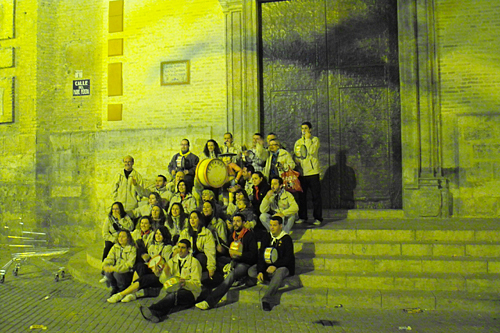 We’ve been to Las Fallas in 2007 and will be back in 2010 bringing friends. I really enjoy reading Mr. Powell’s writings about Vallencia. The maps of the locations of the Fallas, the articles about resturants and the rest is really big help to this old Iowa farm boy. yeah, we want to cover that event as well and we have heard that burning your figures is a little bit better for your health. Do you have any connection to commissions or the tourist office there. We would like to make the best out of it while there. Craziest and most Insane Firework you will ever see!! !